Eat Stop Eat is written by Brad Pilon, who left behind a career in the sports supplement industry so that he could understand the true rules of weight loss and what we should really eat. He says that in his time in the industry he realized that most nutrition research is no longer conducted in order to improve our health but rather is conducted for marketing purposes. Basically food and supplement companies will fund the research because it will help them to be able to sell more of their products. Pilon spent a great deal of time studying weight loss and nutrition and he came to the conclusion that prolonged calorie restriction is the only proven nutritional method of weight loss. Pilon says that our bodies are designed to be in a constant cycle of feeding and fasting. When we eat a large amount of food our bodies store fat so that we can burn it later when we are faced with an inadequate food supply. According to him the key to effortless weight loss is to mimic the dietary patterns of our ancestors by undertaking short but regular fasts. He claims that this is the simplest way to lose weight with minimum disruption to your lifestyle. Contrary to popular opinion, Pilon advises us that fasting for short periods of time does not affect the metabolic rate. He supports his statements with scientific studies that indicate that there is no reduction in metabolism after three days of fasting or when fasting every second day for at least twenty-two days. He advises dieters to fast for 24 hours, once or twice a week and states that this will produce the same effects as an entire week of very strict dieting. However you will never need to go an entire day without eating if you follow his guidelines. In order to fast for 24 hours you simply eat as normally until 6 pm one day and then fast until 6 pm the following day. This method allows you to get the benefits of fasting without the need to stop eating for an entire day. Pilon highlights the fact that it is important to think of a fast as providing a break in your normal eating routine. You should avoid the temptation to overeat on the completion of the fast because this will neutralize the calorie restriction benefits that the fast is designed to produce. Fruits, vegetables, lean protein, herbs, spices, coffee, tea, and artificial sweeteners. Pilon does not offer a meal plan because he says it is not necessary when you adopt the Eat Stop Eat lifestyle. You can look for Healthy Meal ideas here. Resistance exercises are recommended at least two or three times a week because they help to maintain muscle tissue when you are dieting. He suggests adjusting your strength training in terms of its intensity, volume and frequency in order to increase the size of your muscles while you are restricting calories. If you wish you may also add any additional exercises such as yoga, cycling or aerobics. 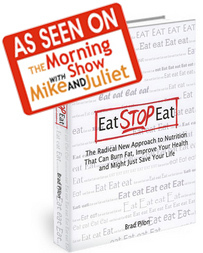 Eat Stop Eat is available as an eBook for $39.95. Packages are also available for $57 and $77 that include additional bonuses such as workout routines and audio files. Click here to order your copy or to learn more. Short-term intermittent fasting has been associated with many health benefits including a potential increase in longevity. Does not require elimination of foods or adjustment of your normal diet. Can help increase awareness surrounding food choices and eating habits. May be followed as a lifestyle approach to weight management. Some dieters may experience hunger and other uncomfortable symptoms such as headaches while fasting for 24 hours. There may be a tendency to overeat after the fast, which will negate the calorie restriction benefits. Not appropriate for those with a history of eating disorders. Does not include diet suggestions or a meal plan for the times when you are not fasting. Not suitable for children, diabetics and pregnant women. Intermittent fasting may offer some dieters an easy way to reduce calories without the need to adjust their usual eating habits and can result in a variety of health improvements. However, in order to achieve success on this plan it is vitally important that dieters avoid the tendency to overeat upon completion of the 24 hour fast, as this will neutralize many of the benefits including weight loss. Drink water, idiots. It’s probably not mentioned because it’s obvious. It doesn’t say anything about breathing during the fast, OMG SHOULD I BREATHE?????? Rie, I have not tried this specific diet, but I do know that no healthy fast would ever tell you not to drink water. It is always important to stay hydrated, no matter where you live.